Super Smash Bros. Brawl[a] is a crossover fighting video game developed by Sora Ltd., HAL Laboratory and Game Arts and published by Nintendo for the Wii. The third installment in the Super Smash Bros. series, it was announced at a 2005 pre-E3 press conference by Nintendo president Satoru Iwata. Masahiro Sakurai, director of the previous two games in the series, assumed the role of director at Iwata's request. Game development began in October 2005 with a creative team that included members from several Nintendo and third-party development teams. After delays due to development problems, the game was released worldwide in 2008. The number of playable characters in Brawl has grown from that in Super Smash Bros. Melee, although some characters from Melee were cut in Brawl. Brawl is the first game in the series to have playable third-party characters. Like that of its predecessors, the objective of Brawl is to knock opponents off the screen. It is a departure from traditional fighting games, notably in its simplified move commands and emphasis on ring outs over knockouts. It includes a more extensive single-player mode than its predecessors, known as the Subspace Emissary. This mode is a plot-driven, side-scrolling beat 'em up featuring computer-generated cut scenes. Brawl supports multiplayer battles with up to four combatants, and is the first game of its franchise to feature online battles via Nintendo Wi-Fi Connection. The game is unique in that it can be played with four different controllers, including the Wii Remote, Wii Remote with Nunchuk, GameCube controller, and Classic Controller, simultaneously. Super Smash Bros. Brawl received critically positive reviews, with praise centered on its entertainment value despite issues relating to its content loading times. Its musical score, composed through a collaboration of 38 renowned video game composers, was lauded for its representation of different generations in gaming history. 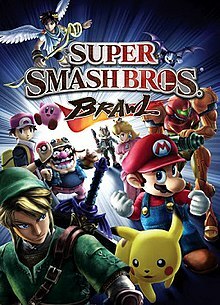 Brawl received an aggregate review score of 93% on Metacritic and was named the "Fighting Game of the Year" by the Academy of Interactive Arts & Sciences. In 2010, the game was included as one of the titles in the book 1001 Video Games You Must Play Before You Die. As of 2008, it is the eighth best-selling Wii game of all time, with over thirteen million copies sold worldwide. It was followed by Super Smash Bros. for Nintendo 3DS and Wii U in 2014. A match between Mario, Kirby, Bowser and King Dedede. The damage meter now displays the name of the character as well as an image of them. Following its predecessors, Brawl uses a battle system unlike that of typical fighting games. Players can choose from a large selection of characters, each attempting to knock their opponents off the screen as they fight on various stages. The characters in Brawl include most of the same ones as the predecessors, such as Mario and Pikachu. Instead of using traditional health bars that start at a maximum value and lose value, Brawl characters start the game with 0%; the value rises as they take damage, to a maximum of 999%. As a character's percentage increases, the character flies further back when hit. When a character is knocked beyond a stage's boundary and disappears from the screen, the character loses either a life, a point, or coins, depending on the mode of play. Brawl includes a function which allows players to create profiles with personalized button configurations for each control method along with their chosen username. The characters in Brawl fight using a variety of attacks, that give the player a wider selection than the predecessors. Players execute each move by pressing a button in conjunction with a tilt of the control stick or a press of the D-pad, depending on the mode of control. In addition to basic attacks, characters have access to more powerful moves, known as smash attacks. Each character has four unique moves, which often cause effects besides damage to an opponent. Brawl introduces character-specific super attacks, referred to as "Final Smashes". Significantly more powerful than regular attacks, these moves have a wide variety of effects that range from nearly unavoidable blasts to temporary transformations. Final Smash moves can be performed by destroying a Smash Ball: a colorful floating orb bearing the Smash Bros. logo. Characters can use items ranging from projectiles to melee weapons; each has a different effect on the characters around it. Although many items have returned from previous Super Smash Bros. games, new ones have been introduced as well. Some returning items have changed appearance and function. Two varieties of items, Assist Trophies and Poké Balls, temporarily summon guest characters and Pokémon, respectively, that generally aid the summoner. They cannot be controlled by players and are usually invincible. In addition to the standard multiplayer mode, Brawl features other multiplayer modes and options in Group mode. Special Melee, from the previous game, returns as Special Brawl. In this mode, players are able to battle in matches using special rules for a greater level of customization. Whereas previously standard options such as "Giant Melee" or "Invisible Melee" were limited to one feature per match, players may now select multiple options for a single match. Another returning game type, Tourney mode (formerly Tournament mode), enables players to create an elimination-based tournament, where up to 32 players can play, with a large number of game-controlled or human-controlled opponents. A "Rotation" feature has been introduced in Brawl, which allows up to sixteen players to compete in sequence by switching out winners or losers after each round. Like its predecessors, Super Smash Bros. Brawl includes various modes of play from the previous game designed for a single player. In Classic Mode, players fight individual characters in a selected order. Each match features an arena or opponent from a particular series, such as The Legend of Zelda or Pokémon. Several matches have a unique battle condition, such as a metal opponent, large opponent, or a two-on-two team battle. Similar to Classic mode are All Star Mode and Boss Battles, where the player has only one life to defeat all of the playable characters and bosses, respectively. Brawl features Events, matches with predetermined battle conditions such as defeating opponents within a time limit or reaching a specific goal. New to single-player mode, each of the 41 Events has three difficulty levels, with a distinct high score recorded for each. In addition to the normal set of 41 Events played with a single player, a smaller set of 21 two-player Events is included. Stadium mode is a collection of objective-oriented minigames. Returning from the two previous games is the "Target Smash!" minigame, in which the player must break ten targets as quickly as possible. In the Home-Run Contest, the player must beat Sandbag to inflict as much damage as possible in 10 seconds, then strike it with a Home-Run Bat. Updated from Melee, all Stadium mode minigames feature cooperative or competitive multiplayer. Original characters were created for the story mode. Pictured is the Ancient Minister, who starts as an antagonist but later becomes the playable fighter R.O.B. Super Smash Bros. Brawl features a new 'Adventure' mode titled "The Subspace Emissary", abbreviated to "SSE". This mode features a unique storyline and numerous side-scrolling levels and bosses, as well as cutscenes explaining the plot. The SSE introduces a group of antagonists called the Subspace Army, led by the Ancient Minister. Some of these enemies appeared in previous Nintendo video games, such as Petey Piranha from the Mario series and a squadron of R.O.B.s based on classic Nintendo hardware. The SSE boasts a number of original enemies, such as the Roader, a robotic unicycle; the Bytan, a one-eyed spherical creature which can replicate itself if left alone; and the Primid, enemies that fight with a variety of weapons. Though the game is primarily played as a single-player mode, cooperative multiplayer is available. The SSE features a mechanism which strengthens a character's abilities in the form of collectible stickers which can be applied to the player's Trophies. Unlike other game modes, the SSE has a team system for the characters, with a limited choice of characters at the beginning of the mode. Others join the team as the game progresses, while some characters may leave the team temporarily. Most characters start off with their own teams, but the teams merge occasionally until they become a unified team by the end of the game. In cooperative multiplayer, once one player loses a life, an ally can take his or her place until the number of lives run out. If there are no lives left and player one is defeated, the game is interrupted, with the choice of quitting or starting again from the previous "door" the player passed through. During the development of Super Smash Bros. Brawl, Sakurai said that this mode would be more "fleshed out" than the single-player modes in previous Smash Bros. titles. Shigeru Miyamoto has explained that Sakurai always wanted to have a deep single-player game, but he wanted Sakurai to focus more on the multiplayer aspects in the previous titles since there were already many single-player games of this kind. Both were possible with the development time allotted for Brawl. Sakurai selected Kazushige Nojima, a scenario writer known for his work on the Final Fantasy series, to construct a plotline for the mode in cooperation with him. The mode begins as Mario and Kirby face each other on a stadium located in the Smash Bros. world. In this world, when a fighter is defeated, they become a trophy which can be revived by touching the base. Suddenly, smoke pours from the sky and the Battleship Halberd releases a stream of black, purple-clouded Shadow Bugs that form the soldiers of the Subspace Army. The Ancient Minister, the cloaked, mysterious Subspace General, arrives and detonates a Subspace Bomb, which can only be detonated by the sacrifice of two R.O.B units, and transports the stadium into Subspace, an alternate dimension where the Subspace Army resides. The Ancient Minister's advance prompts the heroes to ally and attempt to repel the enemy, while villains harvest the power of the allied characters by using dark cannons to convert them into trophies and using Shadow Bugs on some of them to create powerful doppelgängers. King Dedede begins independently gathering some fallen fighters' trophies, placing golden brooches on them. The Ancient Minister is revealed as a subordinate to Ganondorf, Bowser, and Wario, who are under orders from Master Hand to draw the world into Subspace. Wario, who had stolen Ness with his dark cannon, is turned into a trophy by a Pokémon Trainer and Lucas, and is then helplessly sucked in by a Subspace Bomb. Meanwhile, Meta Knight leaves his group to reclaim his stolen ship, the Halberd. He allies with Lucario and Snake, reaching the cockpit and destroying the Mr. Game & Watch clones piloting the battleship. The Ancient Minister's true identity is found to be that of the Master R.O.B. unit, who rebels against Ganondorf to join the allied characters. Bowser and Ganondorf detonate several bombs on their Isle of the Ancients base to create a subspace portal large enough to summon their Subspace Gunship weapon. The three major groups converge and use the Halberd to battle the Gunship. Although the Halberd is destroyed, all of the characters escape unscathed and Ganondorf and Bowser retreat after Kirby destroys the Gunship with his Dragoon. Ganondorf betrays Bowser and turns him into a trophy, only to learn that Master Hand was being manipulated by the actual Subspace Army leader, Tabuu, who turns Ganondorf into a trophy and defeats Master Hand. The allied characters enter Tabuu's chamber, but Tabuu annihilates them all with powerful "Off Waves" and scatters them all throughout Subspace. Dedede's brooches are revealed as a fail-safe against Tabuu's Off Waves and revive Luigi, Kirby, and Ness, who rescue the characters scattered across Subspace and navigate a great maze where Tabuu is located. As Tabuu is about to use his Off Waves to turn the characters back into trophies, he is ambushed by Sonic, who weakens him; the fighters defeat Tabuu and save the Smash Bros. universe. In the final scene, the fighters look at a great luminous cross on the horizon where the Isle of the Ancients once resided. Brawl allows players to play against distant opponents via the Nintendo Wi-Fi Connection. Online multiplayer games can be played either with registered friends or with randomly selected participants. Additionally, players can converse with up to four phrases that are preset by the player, which appear as speech bubbles when activated. These names and phrases are not displayed in random-player matches. The Spectator mode allows players to watch matches being played between other players, and bet on the outcome using coins earned within the game. The winner of the match earns a jackpot of coins. Returning from Melee are trophies, statues of video game characters and objects that give brief histories or descriptions of their subjects, such as Mario and Link, or other characters and items that appear in their respective series. A minigame, the Coin Launcher, replaces the lottery machine from Melee as the primary method of obtaining trophies. The Coin Launcher is a machine that uses coins as projectiles to shoot trophies and counter incoming dangers. Coins can also be used to bet on the victor of online battles via Spectator mode. Trophies unavailable in Coin Launcher mode are obtained by using an item called the Trophy Stand on weakened enemy characters and bosses within The Subspace Emissary. Trophies obtained in this manner may contain information on the backstory of the Subspace Emissary. In addition to trophies, players can now collect stickers of video game artwork. Players can place stickers and trophies onto virtual backgrounds and take snapshots, which can be sent to other players via Nintendo Wi-Fi Connection. Stickers can be applied to characters to power up their abilities in the Subspace Emissary. Other stickers or trophies which cannot be collected through the Coin Launcher minigame, Subspace Emissary, or Vs. matches can be unlocked from the Challenges menu, an interactive display which catalogs unlocked features and items in gridded windows. Once a window has been broken and its contents are unlocked, horizontally adjacent windows display the conditions necessary to unlock them. Brawl contains demo versions of several Nintendo games, named "Masterpieces", which were originally released for older consoles and feature characters playable in Brawl. These games use Virtual Console technology to emulate older hardware and have time constraints ranging from thirty seconds to five minutes. Some use save data to allow the player to play a certain scenario or level. Along with Masterpieces comes the inclusion of the Chronicles section, a library of previous Nintendo games which lists games either previously made or published by Nintendo on all of its consoles. New games appear when certain characters, trophies or stickers related to the game are unlocked. Brawl allows the player to select from 37 playable characters. Some are new, but others return from Melee—in some cases updated or refined, either in appearance, fighting capabilities, or both. For example, Link and Fox have adopted designs from more recent titles, while Samus has gained the ability to change into Zero Suit Samus. Dr. Mario, Roy, Young Link, Mewtwo, and Pichu are the first characters to not return from a previous game, though they do appear as stickers and/or trophies. Some previously represented series have had more characters added to Brawl. Diddy Kong from the Donkey Kong series, Ike from the Fire Emblem series, and Lucas from the EarthBound series make their first appearance in the Smash Bros. series. Other newcomers are the first to represent their series. These include characters such as Pit, representing the Kid Icarus series for the first time since the 1991 Game Boy game Kid Icarus: Of Myths and Monsters, Olimar of the Pikmin series, and Wario, as he appears in Nintendo's WarioWare. Solid Snake, the protagonist of Konami's Metal Gear franchise, and Sonic the Hedgehog from Nintendo's former rival Sega are the first third-party characters to appear in a Super Smash Bros. game. Brawl's stages are generally based on plot devices from the various game series of Super Smash Bros. Stages range from floating platforms to moving areas where the characters must stay within the field of play. Each stage has a boundary that cannot be passed, or the character will be "KO'd", thus losing a life or "point", depending on the mode of play. Brawl contains 41 selectable stages, 29 of which are initially available. Many stages undergo elaborate changes while battles take place, such as a cycling day-to-night system or changing seasons. A stage based on the Animal Crossing series features a live events system in which special events may occur depending on the date and time. Environmental gameplay mechanics are featured in this installment, such as destructible terrain and the ability to float. Unlike its predecessors, Brawl includes stages based on third-party games such as the Metal Gear Solid-inspired Shadow Moses Island. The game also includes stages taken from its predecessor, Super Smash Bros. Melee. Brawl allows players to create their own stages in a mode called Stage Builder. Players can save their stages to an SD card or to the internal memory of the Wii console. Through Nintendo Wi-Fi Connection, players can submit their creations to their friends, or to Nintendo to receive a daily stage from the service. At the pre-E3 2005 press conference, Nintendo president Satoru Iwata announced that the next installment of Super Smash Bros. was soon to be in development for its next console and would be a launch title with Wi-Fi compatibility for online play. The announcement was a surprise to Sakurai, who left HAL Laboratory in 2003. He was not informed of Nintendo's intent to release another Smash Bros. game, despite the fact that Iwata told Sakurai shortly after his resignation from HAL that if a new Smash game was to be developed, he would want Sakurai to again serve as director. It was not until after the conference that Iwata requested that Sakurai hold a private meeting with him, where he was asked to be involved as Brawl's director. Sakurai agreed to become director, and development of the game began in October 2005, when Nintendo opened a new office in Tokyo just for its production. Help from a variety of studios such as Monolith Soft and Paon was enlisted, with Game Arts as the main team in the preliminary development stages. In addition, several Smash Bros. staff members that resided in the area of the new office joined the project. Altogether, roughly 100 individuals worked on the project full-time, and were given access to all the original material and tools from the development of Melee, courtesy of HAL Laboratory. The game was absent from Nintendo's Wii showing at its 2006 pre-E3 press conference. Nintendo officially revealed the game under the name of Super Smash Bros. Brawl the next day, May 10, 2006, along with the game's first official trailer during the E3 After-Hours Press Conference. In an interview with IGN, Sakurai said the Wii's motion sensing features might not be included because "[his team] found that trying to implement too much motion-sensory functionality can get in the way of the game". As far as Wi-Fi play is concerned, Sakurai stated his plan was to include Wi-Fi connection compatibility from the start. He goes on to say, "One of the primary reasons Super Smash Bros. Brawl was created was that Nintendo, when taking Wii online, wanted to have Smash Bros. to do that." However, Sakurai stated on the Japanese version of the Smash Bros. website that there were "hurdles of all sorts that [made] it very difficult" to implement online battles. Furthermore, he said that an online ranking system is unlikely to be implemented. During a test play between Sakurai and Hideo Kojima, Kojima stated that the game felt complete and that Nintendo "could put it out now and it would sell millions of copies". Starting May 22, 2007 and ending April 14, 2008, the game's official site had daily weekday updates, revealing characters, stages, items, music and more. "In order to fine-tune Smash Bros., with this unprecedented game depth, we have decided that we have to take a little more time to complete the game than we announced before. We are sorry for the fans that are already anxiously waiting for the launch, but we would like to launch this game on January 24, 2008 in Japan. As for the North American launch, we will review that too, and our local subsidiaries will make their own announcements." On October 11, 2007, George Harrison of Nintendo of America stated that Super Smash Bros. Brawl would be released on February 10, 2008 in North America. On January 15, 2008, the game's release was delayed one week in Japan to January 31 and nearly a month in the Americas to March 9. On April 24, 2008, Nintendo of Europe confirmed that Brawl would be released in Europe on June 27. Similarly, Nintendo Australia announced on May 15, 2008, that the game would be released in that region on June 26, 2008. Super Smash Bros. Brawl uses a dual-layer disc due to the size of the game data. Nintendo of America has stated that some Wii consoles may have difficulty reading the high-density software due to a contaminated laser lens. Nintendo offered a free repair for owners who experienced this issue. Sakurai revealed a list of 36 musicians providing musical arrangements for the game on May 22, 2007. He asked composers such as Koji Kondo, Yasunori Mitsuda, Yoko Shimomura, and Yuzo Koshiro, amongst many others, "to listen to an elite selection of Nintendo music and arrange several of their favorite songs." The game's various stages have multiple musical tracks which players can listen to using the new "My Music" feature, including some pieces taken directly from other games without any modification or special arrangements. This feature allows the player to select how often a piece gets played during a stage. Some of the pieces need to be unlocked by collecting CDs which are awarded via the game's Challenges Mode, or by spawning randomly while playing. The game's original music was composed by Takahiro Nishi, Shogo Sakai, Masaaki Iwasaki, Yutaka Iraha, Keigo Ozaki, and Kentaro Ishizaka, while the main theme was composed by former Final Fantasy series composer, Nobuo Uematsu, and arranged by Sakai. Sakurai originally stated that he did not want to emphasize Japan-only characters. However, reflecting upon Marth and Roy's inclusion in Melee, which led to the international release of the Fire Emblem series, he became more interested in characters exclusive to Japan-only releases. Sakurai said that third-party characters would amount to two at the most, aside from Snake. The inclusion of Konami-created character Solid Snake may seem to conflict with the Super Smash Bros. paradigm—to only include characters from games made by Nintendo and its second parties—but Sakurai said that Metal Gear creator Hideo Kojima "practically begged" for Snake to be included in Super Smash Bros. Melee, which did not happen since the game was too far into development. This in turn led to his appearance in the following game instead. Similarly, the now-playable Lucas from Mother 3 was intended to be used in Melee, but was left out due to the delay of Mother 3. Japanese fans were asked to submit their desired characters and musical themes via a forum on the game's official Japanese site for possible inclusion. The most requested third-party character, Sega's Sonic the Hedgehog, was announced to be in Brawl on October 10, 2007. Shigeru Miyamoto wanted Sonic to be included in Melee, but, like Snake, could not be implemented because the game was too far into development. During Brawl's development, Sakurai briefly considered adding Miis as playable characters. However, due to concerns about the Miis' lighter tone not meshing with that of Brawl or potential associations with bullying, he ultimately decided against it. Miis would later be integrated into the series as playable characters in Super Smash Bros. for Nintendo 3DS and Wii U.
Super Smash Bros. Brawl has received universal acclaim and has been commercially successful worldwide. In the United States, the game sold 874,000 units on launch day and 1.4 million units in its first week to become the fastest-selling video game in Nintendo of America's history, according to Nintendo. According to the NPD Group, it was the best-selling game of March 2008 in Canada and the United States, selling 200,000 and 2.7 million units, respectively; the game is the best-selling game of 2008 in Canada as of 1 April 2008[update]. Electronic Entertainment Design and Research analyst Jesse Divnich attributed the game's strong US sales to it fulfilling "the needs of the casual, social, and sub-13-year-old markets". Upon release in PAL regions, Brawl reached number one on both European and Australian sales charts. According to the NPD Group, GfK Chart-Track, and Enterbrain, the game has sold 3.539 million units in the United States, 213,000 in the United Kingdom, and 1.681 million in Japan, respectively, for a total of 5.433 million units as of 1 August 2008[update]. It ultimately received a "Platinum" sales award from the Entertainment and Leisure Software Publishers Association (ELSPA), indicating sales of at least 300,000 copies in the United Kingdom. It is also the fifth best-selling game of Japan in 2008, selling 1,747,113 copies. It was the fourth best-selling game of 2008 in the United States, selling over 4.17 million copies. By September 30, 2018, the game had sold 13.29 million units worldwide, according to Nintendo. The editors of Japanese game magazine Famitsu, who awarded it a perfect score, praised the variety and depth of the single-player content, the unpredictability of Final Smashes, and the dynamic fighting styles of the characters. Chris Slate of Nintendo Power awarded Brawl a perfect score in the March 2008 issue, calling it "one of the very best games that Nintendo has ever produced". GameSpot editor Lark Anderson noted that Brawl's "simple controls and gameplay make it remarkably accessible to beginners, yet still appealing to veterans", while GameTrailers mentioned the amount of content that gives the game "staying power that few other games possess". Eurogamer praised the game's ability to stay fun in both single-player and multiplayer modes, while "fulfilling its usual role of dominating a willing crowd's evening into the early hours, and now allowing you to sustain that after everyone's gone home". Game Revolution hailed Brawl's soundtrack as "spectacular ... spanning a generous swath of gaming history". Game Informer highlighted Brawl's "finely tuned balance, core fighting mechanics, and local multiplayer modes". Edge concluded that, while the Smash Bros. games have often been "derided as button-mashing", Brawl features "one of the most enduringly innovative and deep systems of any fighter". IGN editor Matt Casamassina, however, noted that, although Brawl is "completely engrossing and wholly entertaining", it suffers from "long loading times" and "uninspired enemies and locales" in the Subspace Emissary adventure mode. He also described the graphics as "an enhanced version of Melee", with backgrounds that lack detail in areas. GameSpy echoed this by equating the quality of the graphics to that of the GameCube. Mitchell Saltzman of Gameworld Network expressed disappointment at the lack of "stat tracking, voice chat, and a mostly lag free environment" in the online mode. NGamer's Matthew Castle points to the franchise's lack of innovation with the verdict, "Smash Bros risks growing too familiar. It never breeds contempt, but it doesn't quite muster that Galaxy magic." Jeff Gerstmann rated the game 4 out of 5 stars on Giant Bomb, saying that players who are not into Nintendo's history or multiplayer "probably won’t understand what all the fuss is about in the first place". 1UP.com, however, suggested that Brawl is not directed exclusively towards serious gamers, as it offers "a curious diversion for uninterested gamers" as well. Super Smash Bros. Brawl won multiple Wii-specific awards from IGN in IGN's 2008 video game awards, including "Best Fighting Game", "Best Local Multiplayer Game" and "Best Original Score". It was also nominated by them for several other Wii-specific awards, including "Best Graphics Technology", "Best Use of Sound", "Best Online Multiplayer Game" and "Game of the Year". The game also won "Best Fighting Game" in GameSpot's Game of the Year awards 2008. The game placed 15th in Official Nintendo Magazine's 100 greatest Nintendo games of all time. Brawl was ranked by Nintendo Power as the fifth best game of the 2000s released on a Nintendo system. Brawl is unusually moddable for a console game, due to the "Smash Stack" exploit found within the game's built-in stage builder when loading stages from an SD card. Rather than stage data, a specialized program can be inserted onto the SD card that renders the builder unusable while present, but allows loading of fan-made patches from the card on top of the game's on-disc data. These patches range from simple character skins and balance adjustments to more complex modifications such as whole additional characters and extra stages more complex than the internal stage builder allows. In 2011, a team of competitive Super Smash Bros. players, known collectively as the Project M Back Room (PMBR), began development on a mod of Brawl titled Project M. The project was designed to retool Brawl to play more like its predecessor, Super Smash Bros. Melee, in response to complaints about Brawl's physics, slower-paced gameplay, use of chance elements, and mechanics of certain attacks compared to Melee. The mod rebalances each of Brawl's playable characters, adds new character costumes and gameplay modes, and adds the characters Mewtwo and Roy, who were present in Melee but omitted from Brawl's roster. The mod has received praise from many reviewers and fans, with the "Version 3.0" demo having received over 300,000 downloads as of February 2014[update]. The project ceased development on December 1, 2015. ^ Gantayat, Anoop (May 18, 2006). "Sakurai Talks Smash Brothers Brawl". IGN. Archived from the original on February 19, 2014. Retrieved June 19, 2007. ^ a b Casamassina, Matt (May 17, 2005). "E3 2005: Smash Bros. For Revolution". IGN. Archived from the original on November 9, 2012. Retrieved May 3, 2006. ^ a b IGN Staff (November 16, 2005). "Smash Bros. Revolution Director Revealed". IGN. Archived from the original on May 3, 2013. Retrieved June 21, 2007. ^ a b Sakurai, Masahiro. "Foreword". Smash Bros. Dojo!!. Archived from the original on November 16, 2006. Retrieved November 11, 2007. ^ Moses, Travis; Rudden, Dave (April 2008). "Super Smash Bros. Brawl: This is it: The final Super Smash Bros. Brawl preview before the game's release in March...and we've got our lucky paws on an early copy,". GamePro (235): 30–31. ^ Sakurai, Masahiro (November 16, 2007). "Wi-Fi Play". Smash Bros. Dojo!!. Archived from the original on August 11, 2013. Retrieved April 22, 2008. ^ a b c d Casamassina, Matt. "IGN Super Smash Bros. Brawl Review". IGN. Archived from the original on November 28, 2012. Retrieved March 4, 2008. ^ "Four Kinds of Control". Smash Bros. Dojo!!. June 8, 2007. Archived from the original on July 5, 2013. Retrieved June 8, 2007. ^ a b c "Metacritic: Super Smash Bros. Brawl". Metacritic. Archived from the original on August 19, 2010. Retrieved May 8, 2008. ^ a b Sakurai, Masahiro (April 27, 2007). "The Musicians". Smash Bros. Dojo!!. Archived from the original on July 6, 2013. Retrieved September 14, 2007. ^ a b Hudak, Chris. "Super Smash Bros. Brawl Review at Game Revolution – Hit me with your best shot". Game Revolution. Archived from the original on June 16, 2012. Retrieved April 21, 2008. ^ "Fighting Game of the Year". Academy of Interactive Arts & Sciences. February 19, 2009. Archived from the original on July 13, 2010. Retrieved December 22, 2009. ^ Mott, Tony (2010). 1001 Video Games You Must Play Before You Die. London: Quintessence Editions Ltd. p. 830. ISBN 978-1-74173-076-0. ^ "Super Smash Bros. Brawl: Video Games". Amazon. Archived from the original on August 28, 2008. Retrieved July 15, 2008. ^ Sakurai, Masahiro (May 22, 2007). "The Basic Rules". Smash Bros. Dojo!!. Archived from the original on July 3, 2013. Retrieved August 11, 2007. ^ Sakurai, Masahiro (June 28, 2007). "Names". Smash Bros. Dojo!!. Archived from the original on July 5, 2013. Retrieved August 11, 2007. ^ a b c Casamassina, Matt; Schneider, Peer (May 10, 2006). "E3 2006: Super Smash Bros. Brawl". IGN. Archived from the original on November 9, 2012. Retrieved August 1, 2006. ^ Sakurai, Masahiro (May 29, 2007). "What is a Final Smash?". Smash Bros. Dojo!!. Archived from the original on July 3, 2013. Retrieved June 21, 2007. ^ Sakurai, Masahiro (November 6, 2007). "Items from previous installments". Smash Bros. Dojo!!. Archived from the original on December 11, 2013. Retrieved November 6, 2007. ^ Sakurai, Masahiro (August 13, 2007). "What are Assist Trophies?". Smash Bros. Dojo!!. Archived from the original on October 19, 2013. Retrieved July 2, 2007. ^ Sakurai, Masahiro (August 13, 2007). "What are Poké Balls?". Smash Bros. Dojo!!. Archived from the original on October 19, 2013. Retrieved June 5, 2007. ^ Sakurai, Masahiro (August 13, 2007). "Samurai Goroh". Smash Bros. Dojo!!. Archived from the original on July 3, 2013. Retrieved July 2, 2007. By the way, the majority of Assist Trophies are invincible. Trying to fight back is useless, so just run away. ^ Sakurai, Masahiro (September 13, 2007). "Special Brawl". Smash Bros. Dojo!!. Archived from the original on July 5, 2013. Retrieved September 13, 2007. ^ Sora Ltd., ed. (March 9, 2008). Super Smash Bros. Brawl instruction manual. Nintendo. p. 17. ^ Sakurai, Masahiro (September 28, 2007). "Tourney Mode". Smash Bros. Dojo!!. Archived from the original on July 5, 2013. Retrieved September 28, 2007. ^ Sakurai, Masahiro (December 11, 2007). "Rotation". Smash Bros. Dojo!!. Archived from the original on July 5, 2013. Retrieved December 11, 2007. ^ Sakurai, Masahiro (October 30, 2007). "Classic". Smash Bros. Dojo!!. Archived from the original on July 7, 2013. Retrieved October 17, 2007. ^ Sakurai, Masahiro. "All-Star Mode". Smash Bros. Dojo!!. Archived from the original on August 5, 2013. Retrieved April 27, 2008. ^ Sakurai, Masahiro. "Boss Battles". Smash Bros. Dojo!!. Archived from the original on August 17, 2014. Retrieved April 27, 2008. ^ Sakurai, Masahiro (November 29, 2007). "Events". Smash Bros. Dojo!!. Archived from the original on July 5, 2013. Retrieved November 29, 2007. ^ a b Sakurai, Masahiro (December 17, 2007). "Co-op Events". Smash Bros. Dojo!!. Archived from the original on July 5, 2013. Retrieved December 17, 2007. ^ a b Sakurai, Masahiro (October 24, 2007). "Stadium: Target Smash!". Smash Bros. Dojo!!. Archived from the original on July 5, 2013. Retrieved October 24, 2007. ^ Sakurai, Masahiro (October 16, 2007). "Stadium: Home-Run Contest". Smash Bros. Dojo!!. Archived from the original on July 5, 2013. Retrieved October 17, 2007. ^ Sakurai, Masahiro (September 19, 2007). "The Enemies From Subspace". Smash Bros. Dojo!!. Archived from the original on October 19, 2013. Retrieved September 19, 2007. ^ a b Sakurai, Masahiro (January 18, 2008). "Sticker Power-ups". Smash Bros. Dojo!!. Archived from the original on October 19, 2013. Retrieved January 18, 2008. ^ Sakurai, Masahiro (August 24, 2007). "Petey Piranha". Smash Bros. Dojo!!. Archived from the original on October 19, 2013. Retrieved October 8, 2007. ^ Sakurai, Masahiro (August 3, 2007). "What is the Subspace Emissary?". Smash Bros. Dojo!!. Archived from the original on April 2, 2014. Retrieved August 11, 2007. ^ Bramwell, Tom (May 11, 2005). "Miyamoto and Sakurai on Nintendo Wii". Eurogamer. Archived from the original on December 20, 2008. Retrieved August 11, 2007. ^ a b Sakurai, Masahiro. "Iwata Asks: Super Smash Bros. Brawl". Wii.com (Interview: Transcript). Interviewed by Satoru Iwata. Archived from the original on January 5, 2009. Retrieved April 11, 2008. ^ Sakurai, Masahiro. "Mysteries of the Subspace Emissary". Smash Bros. Dojo!!. Archived from the original on August 5, 2013. Retrieved April 27, 2008. ^ Gantayat, Anoop (October 9, 2007). "Nintendo Conference 2007 Fall". IGN. Retrieved October 10, 2007. ^ "Wi-Fi Play". Smash Bros. Dojo!!. September 18, 2007. Archived from the original on August 11, 2013. Retrieved September 18, 2007. ^ a b Sakurai, Masahiro (November 16, 2007). "Spectator". Smash Bros. Dojo!!. Archived from the original on October 19, 2013. Retrieved November 16, 2007. ^ Sakurai, Masahiro (October 12, 2007). "Taking Snapshots". Smash Bros. Dojo!!. Archived from the original on July 5, 2013. Retrieved October 12, 2007. ^ "Smash Bros. DOJO!!". Nintendo/HAL Laboratory. June 8, 2009. Retrieved December 18, 2011. ^ "Nintendo killing online support for Mario Kart Wii, Super Smash Bros. Brawl in May". Gamespot. February 27, 2014. Retrieved May 14, 2018. ^ a b Sakurai, Masahiro (September 24, 2007). "Trophies". Smash Bros. Dojo!!. Archived from the original on July 5, 2013. Retrieved October 24, 2007. ^ Sakurai, Masahiro (December 27, 2007). "Coin Launcher". Smash Bros. Dojo!!. Retrieved October 27, 2007. ^ Sakurai, Masahiro (December 26, 2007). "Trophy Stands". Smash Bros. Dojo!!. Archived from the original on October 19, 2013. Retrieved December 30, 2007. ^ a b Sakurai, Masahiro (August 15, 2007). "Stickers". Smash Bros. Dojo!!. Archived from the original on July 3, 2013. Retrieved October 24, 2007. ^ Sakurai, Masahiro (January 14, 2008). "Challenges". Smash Bros. Dojo!!. Archived from the original on July 5, 2013. Retrieved January 19, 2008. ^ Sakurai, Masahiro (January 25, 2008). "Masterpieces". Smash Bros. Dojo!!. Archived from the original on May 11, 2015. Retrieved January 25, 2008. ^ Sakurai, Masahiro (January 28, 2008). "Vault". Smash Bros. Dojo!!. Archived from the original on July 5, 2013. ^ Sakurai, Masahiro (May 22, 2007). "Battlefield". Smash Bros. Dojo!!. Archived from the original on December 11, 2013. Retrieved June 21, 2007. On Battlefield, the main platform will not change... But then evening comes... And then comes night. You can brawl til dawn! ^ Sakurai, Masahiro (June 12, 2007). "Yoshi's Island". Smash Bros. Dojo!!. Archived from the original on December 11, 2013. Retrieved June 21, 2007. The highlight of this stage is its seasonal changes, as it goes from spring to summer to fall and then winter. ^ Sakurai, Masahiro (July 13, 2007). "Smashville". Smash Bros. Dojo!!. Archived from the original on December 13, 2013. Retrieved December 22, 2007. ^ Sakurai, Masahiro (October 2, 2007). "Shadow Moses Island". Smash Bros. Dojo!!. Archived from the original on December 11, 2013. Retrieved December 22, 2007. ^ Sakurai, Masahiro (November 30, 2007). "Melee Stages". Smash Bros. Dojo!!. Archived from the original on December 11, 2013. Retrieved December 16, 2007. ^ Sakurai, Masahiro (October 29, 2007). "Stage Builder". Smash Bros. Dojo!!. Archived from the original on July 5, 2013. Retrieved October 29, 2007. ^ a b Sakurai, Masahiro. "Masahiro Sakurai's Thoughts About Games". Famitsu. Smashbros.com. p. 4. Archived from the original on July 17, 2006. Retrieved December 21, 2009. ^ Sora Ltd.; Game Arts Co., Ltd. (March 9, 2008). Super Smash Bros. Brawl. Nintendo of America, Inc. Scene: staff credits. ^ a b Sakurai, Masahiro. "Iwata Asks: Super Smash Bros. Brawl". Wii.com (Interview: Transcript). Interviewed by Satoru Iwata. Archived from the original on July 7, 2009. Retrieved December 21, 2009. ^ Gantayat, Anoop (December 5, 2005). "Sakurai Elaborates on Smash Bros. Revolution". IGN. Retrieved June 21, 2007. ^ Casamassina, Matt (February 20, 2008). "Sakurai on Super Smash Bros. Brawl". IGN. Archived from the original on May 5, 2014. Retrieved April 27, 2008. ^ Dormer, Dan (April 27, 2007). "Kojima's Played Super Smash Bros. Brawl". 1UP.com. Retrieved June 21, 2007. ^ Casamassina, Matt (July 11, 2007). "Nintendo E3 2007 Press Conference". IGN. Archived from the original on November 9, 2012. Retrieved July 11, 2007. ^ "Nintendo Conference Fall 2007". E-news.co.jp. October 10, 2007. Archived from the original (mpg) on October 11, 2007. Retrieved October 11, 2007. ^ Bozon, Mark (October 11, 2007). "Smash Release Date Confirmed". IGN. Archived from the original on November 9, 2012. Retrieved October 14, 2007. ^ Casamassina, Matt (January 14, 2008). "Breaking: Smash Bros. Delayed". IGN. Archived from the original on November 9, 2012. Retrieved January 20, 2008. ^ "Nintendo announces Q2 release schedule". Nintendo. April 24, 2008. Retrieved April 24, 2008. ^ "Super Smash Bros. Brawl at Nintendo Australia". Nintendo. May 14, 2008. Archived from the original on April 8, 2008. Retrieved May 14, 2008. ^ Nintendo of America. "Repair Form for U.S. Residents". Nintendo of America. Archived from the original on December 23, 2008. Retrieved April 9, 2013. ^ Sakurai, Masahiro (September 7, 2007). "My Music". Smash Bros. Dojo!!. Archived from the original on July 5, 2013. Retrieved October 28, 2007. ^ Schneider, Peer (May 10, 2006). "E3 2006: Uematsu Scores Smash Bros". IGN. Archived from the original on December 19, 2013. Retrieved May 10, 2006. ^ "'Fire Emblem Series'". NinDB. Archived from the original on April 13, 2012. Retrieved July 7, 2007. ^ a b Klepek, Patrick (June 5, 2006). "Super Smash Bros. Brawl Details". 1UP.com. Retrieved September 13, 2007. ^ Schneider, Peer; Casamassina, Matt (May 10, 2006). "Super Smash Bros. Brawl: Preview". IGN. Archived from the original on November 9, 2012. Retrieved July 1, 2008. ^ Mcwhertor, Michael (May 11, 2006). "E306: Super Smash Bros. Brawl Q&A". Kotaku. Archived from the original on March 24, 2012. Retrieved September 18, 2007. ^ "速報スマブラ拳: Ness" (in Japanese). Nintendo. Archived from the original on July 7, 2014. Retrieved October 21, 2007. ^ IGN Staff (May 11, 2006). "E3 2006: Fans Asked to Fill Smash Bros. Roster". IGN. Archived from the original on November 3, 2013. Retrieved May 11, 2006. ^ Sakurai, Masahiro (October 10, 2007). "Sonic". Smash Bros. Dojo!!. Archived from the original on July 5, 2013. Retrieved October 10, 2007. ^ SXSWGaming (March 19, 2016). SXSW Gaming: March 17 - 19, 2016 in Austin, Texas. Retrieved January 8, 2018. Yuji Naka (translated): During the GameCube development for Smash Bros., [Miyamoto] really wanted to get Sonic into that game, but it was just too late in the development process and couldn’t get it in for GameCube, but they did move forward and put Sonic in for the Wii version. Event occurs at 03:47:57. ^ Mielke, James (March 7, 2008). "Super Smash Bros. Brawl Review". 1UP.com. Retrieved May 16, 2008. ^ Marriott, Scott Alan. "Super Smash Bros. Brawl Review". AllGame. Archived from the original on November 14, 2014. Retrieved November 30, 2017. ^ Edge staff (April 2008). "Super Smash Bros. Brawl Review". Edge (187): 84–85. ^ a b Bramwell, Tom. "Eurogamer Super Smash Bros. Brawl Review". Eurogamer. Archived from the original on December 24, 2008. Retrieved March 27, 2008. ^ a b Gray, Brian (January 16, 2008). "Famitsu Gives Smash Bros. Brawl a Perfect Score". 1up.com. Retrieved April 27, 2008. ^ a b Lark, Anderson. "GameSpot Super Smash Bros. Brawl Review". GameSpot. Archived from the original on February 3, 2014. Retrieved January 21, 2014. ^ a b "GameTrailers Super Smash Bros. Brawl Review". GameTrailers. Archived from the original on October 14, 2012. Retrieved March 9, 2008. ^ a b Slate, Chris (March 2008). "Simply Smashing". Nintendo Power. 226. Future US. pp. 82–83. ^ "Super Smash Bros. Brawl Review". Nintendo Life. Retrieved February 20, 2011. ^ "SSBB Review". Nintendo World Report. Retrieved February 13, 2011. ^ "Super Smash Bros. Brawl Review". Destructoid. Retrieved January 29, 2011. ^ "Super Smash Bros. Brawl Review". GamesRadar. Retrieved February 15, 2011. ^ "SSBB Review". Game Informer. Archived from the original on September 18, 2010. Retrieved February 22, 2011. ^ Mathers, Martin (June 26, 2008). "Wii Review: Super Smash Bros". Official Nintendo Magazine. Archived from the original on February 21, 2011. Retrieved October 2, 2008. ^ a b Castle, Matthew. "Ngamer — Review: Super Smash Bros. Brawl". NGamer. Archived from the original on August 11, 2011. Retrieved February 26, 2008. ^ a b "Gamespot: Best Fighting Game of the Year". GameSpot. Archived from the original on December 30, 2008. Retrieved February 23, 2009. ^ "Super Smash Bros. Brawl Smashes Nintendo Sales Records" (Press release). Nintendo. March 17, 2008. Archived from the original on September 15, 2008. Retrieved August 3, 2008. ^ "NPD Reports Nintendo Finished March with Top Game, Top Hardware". IGN. Retrieved April 17, 2008. ^ "Wii surpasses all other next generation consoles in lifetime sales" (Press release). Nintendo. April 17, 2008. Retrieved April 24, 2008. ^ Sinclair, Brendan (April 18, 2008). "Analyst: March a perfect sales storm". GameSpot. Archived from the original on January 21, 2016. Retrieved August 3, 2008. ^ Lee, James (July 7, 2008). "Super Smash Bros Brawl takes top spot in Europe". Game Industry. Archived from the original on July 13, 2008. Retrieved July 13, 2008. ^ Chiappini, Dan (July 3, 2008). "Aussie game charts: June 23–29". GameSpot. Archived from the original on January 21, 2016. Retrieved July 13, 2008. ^ "Leading Market Research Firms Join Forces to Provide First Multi-Continent View Of Video Game Software Sales" (Press release). NPD Group, GfK Chart-Track, Enterbrain. August 21, 2008. Archived from the original on October 16, 2012. Retrieved August 23, 2008. ^ "NPD: Nintendo Drives '08 Industry Sales Past $21 Billion". Game Daily. January 15, 2009. Archived from the original on January 17, 2009. Retrieved January 15, 2009. ^ "Perfect Score for Smash Bros". IGN. January 16, 2008. Archived from the original on November 9, 2012. Retrieved January 29, 2008. ^ Vore, Bryan. "Super Smash Bros. Brawl Review: Smash It Up". Game Informer. Archived from the original on April 14, 2008. Retrieved April 21, 2008. ^ "Super Smash Bros. Brawl (wii: 2008): Reviews". Metacritic. Archived from the original on August 19, 2010. Retrieved April 23, 2008. ^ Villoria, Gerald. "Super Smash Bros. Brawl review at GameSpy". GameSpy. Archived from the original on March 12, 2008. Retrieved March 8, 2008. ^ Saltzman, Mitchell. "Super Smash Bros. Brawl Review". Gameworld Network. Archived from the original on March 13, 2008. Retrieved April 23, 2008. ^ Gerstmann, Jeff. "Super Smash Bros. Brawl – Review". Giant Bomb. Archived from the original on July 28, 2013. Retrieved March 28, 2008. ^ Mielke, James (March 7, 2008). "Super Smash Bros. Brawl – Review". 1UP.com. Retrieved April 20, 2008. ^ "IGN Wii: Best Fighting Game 2008". IGN.com. December 18, 2008. Archived from the original on December 22, 2008. Retrieved December 19, 2008. ^ "IGN Wii: Best Local Multiplayer Game 2008". IGN.com. December 18, 2008. Archived from the original on December 22, 2008. Retrieved December 19, 2008. ^ "IGN Wii: Best Original Score 2008". IGN.com. December 18, 2008. Archived from the original on December 22, 2008. Retrieved December 19, 2008. ^ "IGN Wii: Best Graphics Technology 2008". IGN.com. December 18, 2008. Archived from the original on December 22, 2008. Retrieved December 19, 2008. ^ "IGN Wii: Best Use of Sound 2008". IGN.com. December 18, 2008. Archived from the original on December 22, 2008. Retrieved December 19, 2008. ^ "IGN Wii: Best Online Multiplayer Game 2008". IGN.com. December 18, 2008. Archived from the original on December 22, 2008. Retrieved December 19, 2008. ^ "IGN Wii: Game of the Year 2008". IGN.com. December 18, 2008. Archived from the original on December 22, 2008. Retrieved December 19, 2008. ^ "20–11 Official Nintendo Magazine". Official Nintendo Magazine. Archived from the original on June 29, 2012. Retrieved February 25, 2009. ^ a b Rigney, Ryan (December 9, 2013). "The Best Super Smash Bros. Isn't Made by Nintendo". Wired. Archived from the original on January 21, 2014. Retrieved January 21, 2014. ^ George, Richard (April 19, 2012). "Rebuilding Super Smash Bros". IGN. Archived from the original on February 23, 2014. Retrieved January 20, 2014. ^ Todd, Nick (April 21, 2012). "Fans Take Up Arms and Fix Nintendo's Fighter Themselves". 1UP.com. Archived from the original on October 21, 2014. Retrieved January 27, 2014. ^ Betka, Zach (January 10, 2014). "Be Inspired by These Ambitious Video Game Fan Projects". GamesRadar. Archived from the original on February 20, 2014. Retrieved January 27, 2014. ^ Hernandez, Patricia (December 10, 2013). "How To Play Project M, The Best Smash Bros. Mod Around". Kotaku. Archived from the original on January 30, 2014. Retrieved February 19, 2014. ^ Devore, Jordan (November 19, 2013). "Smash Bros. mod Project M 3.0 gets one heck of a trailer". Destructoid. Archived from the original on February 24, 2014. Retrieved February 19, 2014. ^ "Tweet by @ProjectMGame". Twitter. February 24, 2014. Archived from the original on March 29, 2014. Retrieved March 20, 2014. We recently broke the 300,000 download threshold via the website. That's more than triple 2.5/2.6 got in their year or so. Thank you!! ^ "Project M". Project M. December 1, 2015. Archived from the original on December 2, 2015. Retrieved January 13, 2018.